Dingding Hu, who works as an illustrator, is a life observer, color lover, and storyteller who is aimed at making juice out of everyday ordinary. She specializes in illustrating scenes, characters and objects, and believes that storytelling should not be limited by media. She has made stickers for Google Allo, illustrated map of Chinatown for MOCA NYC, as well as drawn hot dogs for Lucky Peach Magazine, among other projects. Raised in the spicy food heaven, Szechuan (China), and settled in the global food headquarter, New York, food has been Dingding’s destiny all along the way. During her daily rountine, she is either drawing or busy feeding her stomach and mind, as well as researching new ways of fulfilling her ever-persistent hunger. In 2016 she started to create her own product line, Hu is Hungry, a stationery and gifts collection that is related to food in multiple facets, taking a strong influence from modern cusine and comedy scene as well as contemporary art and graphic design. I have lived in US for less than 5 years, and was disappointed to find out Rockfeller Center has the exact same ornaments every year. After this discovery, I spent Christmas of 2015 mostly at home. After eating different style of Hot Pot for a whole week while watching all the Star Wars movies with my boyfriend, I realized that was the most awesome and fulfilling Christmas I have ever had! I also really love the gift opening session every authentic Christmas that I was lucky enough to have spent with loved ones in the US. 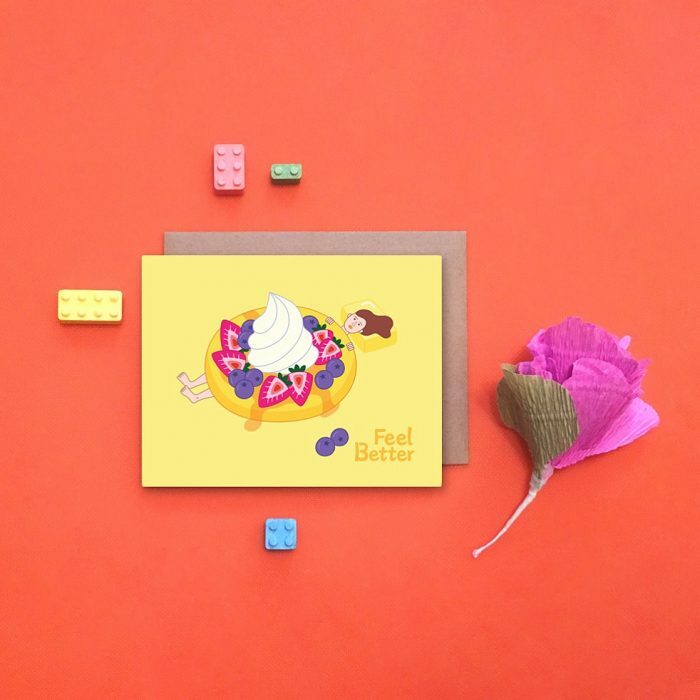 “Hu is Hungry” works hard to bring more joy into the world of stationery and gifts by celebrating our daily connection with food. The delicious food that is cooked, prepared, and enjoyed throughout the world is a magical ingredient that brings peoples and cultures together at the table. We want to narrow the gap between the culinary industry and the graphic design / illustration industry and make the world a better place with an effecient and entertaining celebration of food and its delicious culture. Hu is Hungry resonates with people’s who love food, celebrates humor as well as bring joyness with its vivid color. “Hu is Hungry” is perfect for artists and designers who care about the world of visual communication, chefs and foodies who are passionate about the culinary world, as well as innovative individuals who have a combined interest in both worlds. We welcome kids who adore interesting ideas, young professionals who embrace creative thinking, and career-minded individuals who appreciate artistic life styles. We are also aimed to generate a shared interest among different gender identities since food is a universal language.